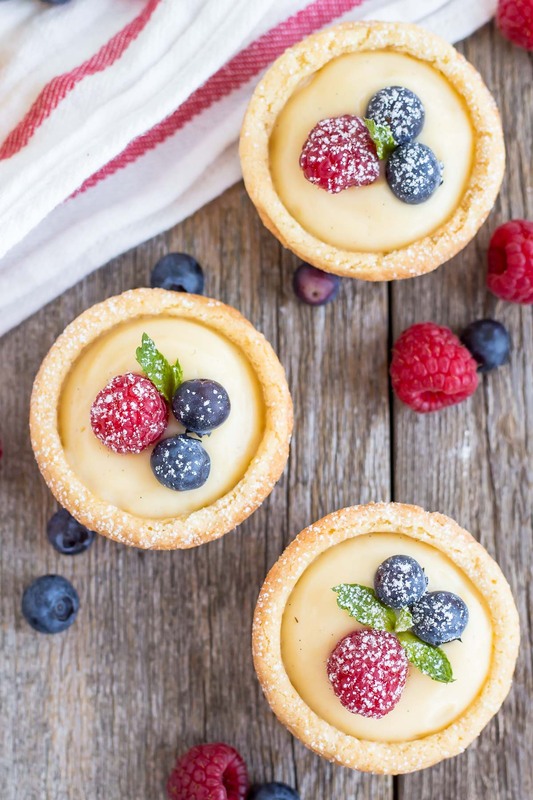 Bite-sized sugar cookie cups filled with a vanilla custard and topped with fresh berries. Not sure about you, but I am ready for spring. Like, SO ready. We had so much snow this winter it’s not even funny. For a place that rarely gets snow at all, it’s been a littler ridiculous. 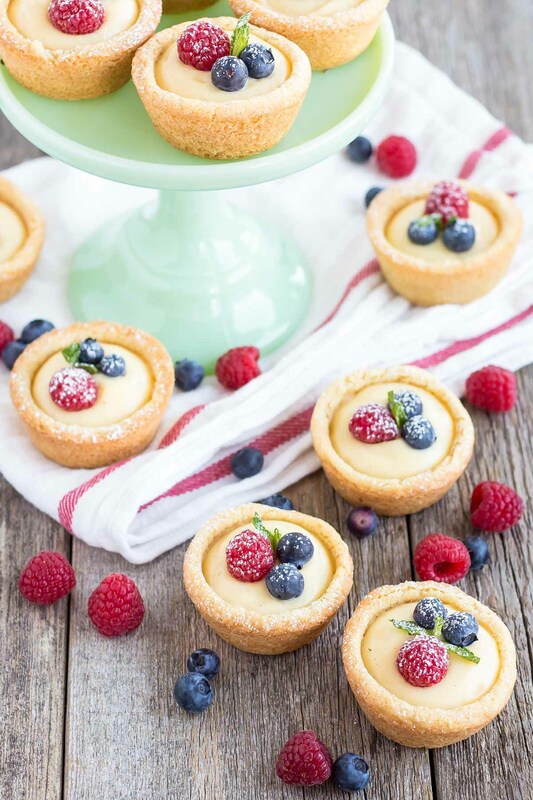 Sadly, we still have some time to go before those spring flowers make their debut, so I’m bringing a bit of spring and sunshine to you today with these Vanilla Custard Cookie Cups! Yes, more cookie cups. I love them, and based on my top posts from last year, it seems like you love them too! And what’s not to love? 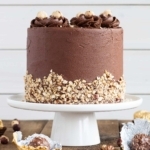 They are much easier to throw together than a layer cake, and just as pretty and delicious. 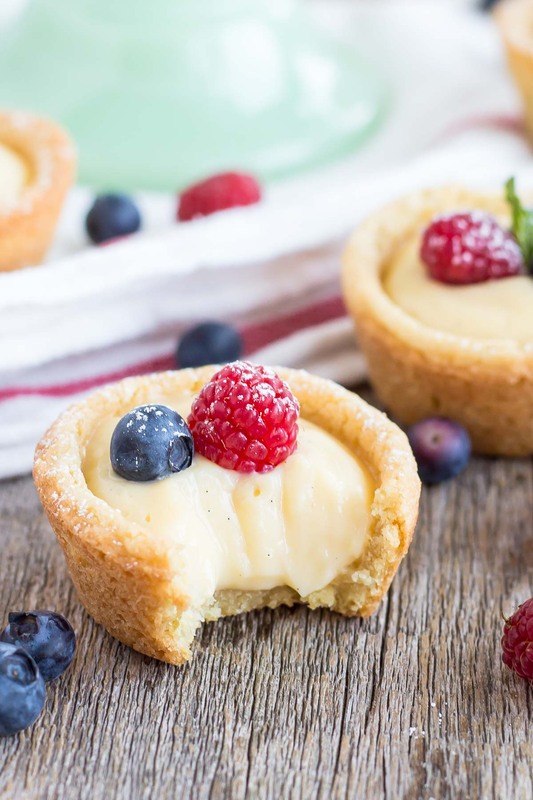 These Vanilla Custard Cookie Cups are a little different from my other cookie cups, which typically use a cheesecake and whipped cream filling. These ones use a delicious vanilla pastry cream as the filling. Pastry cream (aka vanilla custard) is often used as a filling for various baked goodies — like eclairs or Boston cream donuts. It involves a few simple ingredients: milk, egg yolks, vanilla, sugar, and cornstarch as a thickener. Heat up the milk, whisk it into the egg yolks and cornstarch, cook till it boils, strain, and cool. Truthfully, I don’t love pastry cream. Something about the flavour is off-putting to me (probably the cornstarch), but I am clearly in the minority here, as it is a beloved filling of many. 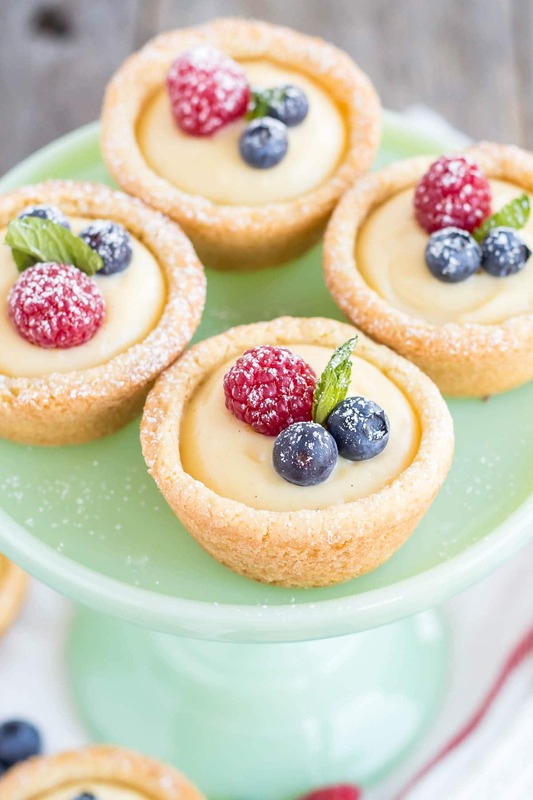 As such, I thought it would be perfect for these Vanilla Custard Cookie Cups. 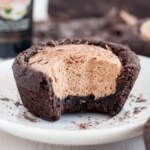 Like the filling, the cookie cup base here is also a little different than my other cookie cups (but only slightly). I wanted it to be lighter and more like a sugar cookie, so I used only granulated sugar and no light brown sugar. I think they came out pretty perfect! 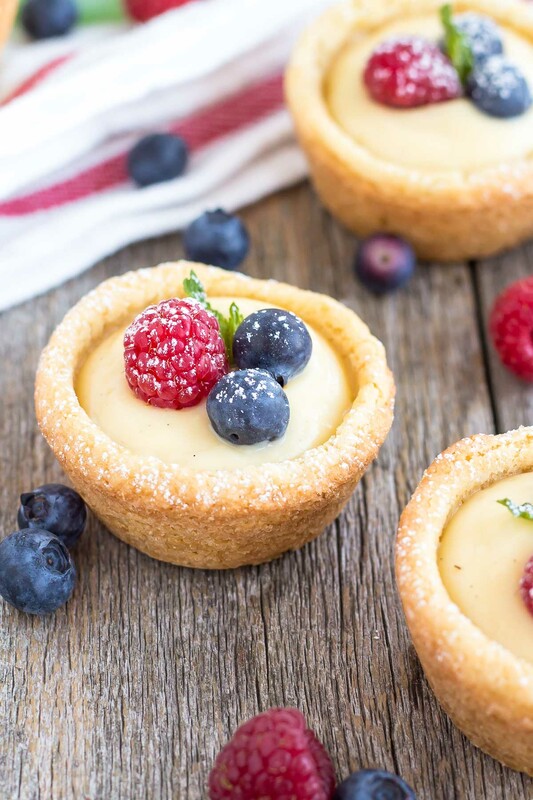 Topped off with some fresh berries and a simple dusting of powdered sugar, these Vanilla Custard Cookie Cups are the perfect treat to tide you over until spring and summer. If you don’t have vanilla bean paste, you can use 1 tsp of vanilla instead. 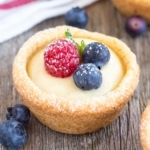 You can use vanilla pudding in place of pastry cream if you prefer. Serve within two days. These do not freeze well. 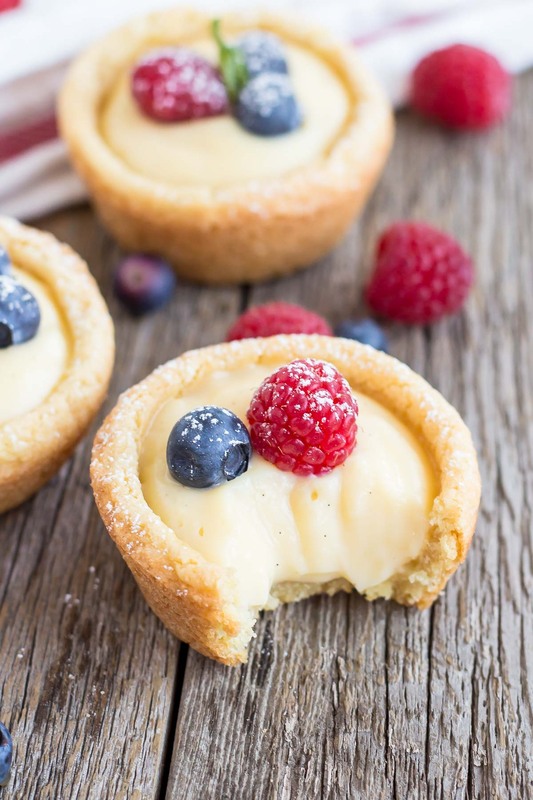 Bite-sized sugar cookie cups filled with a creamy vanilla custard and topped with fresh berries. Place 3 cups milk and vanilla bean paste into a medium saucepan. Cook over high heat, stirring often until it just starts to simmer. Remove from heat. In a medium bowl, whisk remaining 1 cup milk, egg yolks, sugar, and cornstarch. While whisking vigorously, slowly pour the hot milk into the egg mixture. Return mixture to saucepan and cook over high heat, whisking constantly, until it thickens and comes to a boil. Pass through a strainer and into a small bowl. Place plastic wrap directly on top of custard to prevent a skin from forming. Place in refrigerator to cool completely. 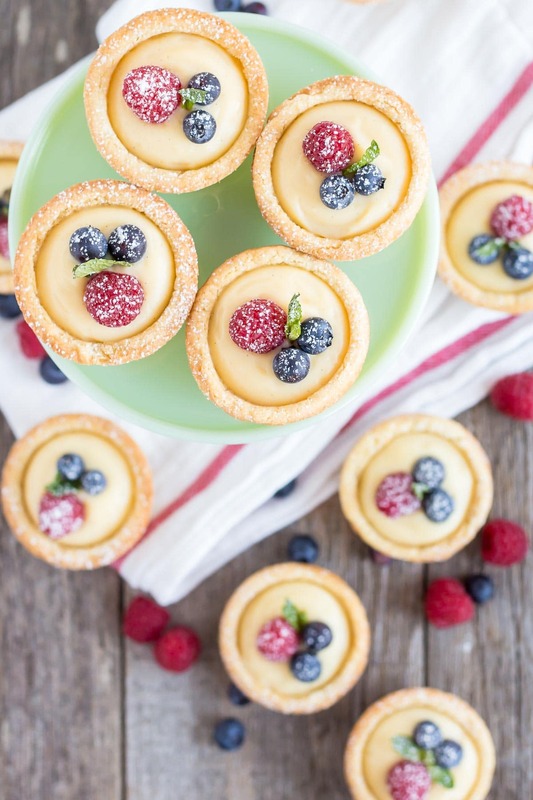 Whisk custard to a smooth texture and pipe into cooled cookie cups. Top with fruit if desired. Store in fridge and serve within two days. I’ve used this recipe before and absolutely loved it. As for making the cups in advance, could I store them for 1 week in an airtight container? The custard I’ll do on the day. Hi Gina! The cups will last for sure. I’d actually suggest freezing them in an airtight container. Hi Olivia. I tried your recipe yesterday and must say the custard was DELICIOUS! I had a little problem with the cookie cup though. I baked them according to the recipe and the centers turned out a little under-baked so I put them back in for a few minutes longer. I’m just wondering if I over-filled the cupcake pan. Nonetheless, these tasted so yummy and were the hit of my Easter dinner. Hi Margaret! I’m so happy to hear that you liked these! 🙂 It’s possible that your cupcake pan is a bit smaller than mine (they’re not all created equal and even between my three pans I have one that works best). You can try using a little less cookie dough next time or baking them for a tad longer. Every oven is different too! Hi Huda! I’m sorry to head this didn’t work for you. Something must have been off in your measurements as the dough should be stiff. I’m having the same problem. The dough is very sticky. I followed the directions exactly paying careful attention to the measurements. I am putting the dough in the fridge before trying to put in the muffin tins. Hopefully the dough will harden enough to be workable. Perhaps you mentioned refrigerating the dough and I missed it. Do you know if I should add more flour or just fridge the dough for a while? Hi Juli! I did not refrigerate the dough, no. Hmm, it definitely should not be sticky — not more than any normal cookie dough at least. It sounds like something was off in the measurements — did you use cups or grams, out of curiosity? hmm. I guess a mini cupcake pan is out of the question when I make cookie cups, huh. and I was hoping to use my mini cupcake pan to make cookie cups. Hi Heather! A mini cupcake pan should work fine, though I’ve never tried it myself. Does it matter what type of milk used? Skim or whole milk? Anything inbetween? Hi Kelley! Any kind should work. I used 1%. 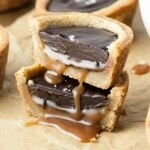 can i make the the cookie cups in advance? And if so – do they need to be refrigerated? I am going to guess you can’t really make the custard in advance or i might be wrong? 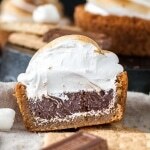 Wanting to bake these for a baptism on saturday, but I’m not sure if ill have that much time! Hi Kimberley! These do not keep very well, but the components can be made in advance. I would recommend making the cookie cup part in advance and storing in an airtight container. The custard should keep for a day or two in the fridge covered in plastic wrap. Ideally, assemble on the day of serving. I hope that helps! 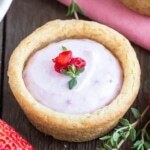 yes – i was thinking of making the cookies part in advance, and making the custard/strawberry cream cheese part on the day – would that be ok you think? Yep! That will work fine 🙂 The strawberry cream cheese ones keep really well by the way, and freeze well. It’s just the custard ones that should be served within a day or two. Let me know how you like them! 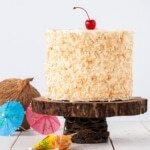 Instead of the vanilla bean paste can you use vanilla extract? Hi Erin! Yes, that will work fine. I was wondering if I could freeze them? Do you know? Hi Stephanie! Hmm, I haven’t tried, I’m not sure how well custard freezes/thaws. Hi! Wouldn’t it be easier to just bake the cookie base with foil and beans to weigh them down so they don’t puff up? 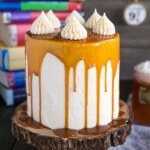 Looks delicious though! Hi Gie! You could try it this way, but I think it would be more work and the cookies might not bake up as evenly. These looks so yummy! But is it supposed to be this “doughy” when you take them out of the oven? Hi Ranveig, I’m not sure what you mean — the cookies aren’t fully set when they come out of the oven so that you can press into them to make the cups. 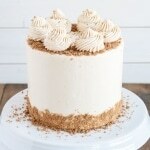 This look really yummy! I saw this on Pinterest, and I can’t tell you how thrilled I was to see that you actually included a recipe for the cookie cups. I was afraid it would be store bought sugar cookie dough, which I really don’t care much for. Looking forward to trying this. Thanks for sharing. If you put the dough into a muffin (or mini muffin) pan and then press a second pan on top would you have the same effect? I’d take out the second pan to have the cookie cups brown up a few minutes before the end. Hi Annick! I’ve never tried that method so can’t say for sure, but in theory it should work if there is enough of a gap along the sides for the cookies to rise. You could always try it just with one to see how it does. Let me know if you do! Hi Olivia these look really great!!! But wanted to check on the measurements of custard in the directions it only calls for two cups total but on the ingredients list it says 4 cups of milk. I’ve made a lot of custard in my life for different pies and have had them call for either 2 or 4 cups mattering on the size of what I’m baking so I’m thinking it’s only the 2 cups but just want to clarify. I’m one of those people that love vanilla custard it’s lucky if it makes it out of the bowl. lol Can’t wait to make. Ack! Good catch. I ended up doubling the recipe but forgot to double it in the instructions 😳 It should be 4 cups total of milk. I’ll update it! Do you think these could be ‘bruleed’? Like creme brûlée? She much easier than the original if so. Also, which of your cookie cup recipes included brown sugar? I love the flavor. Hi Pam! I’ve never tried, but I don’t see why not :). All of my other cookie cups (except the strawberry one), use brown sugar in the cookie part. I love the flavour too! But it gives the cookies a darker color.